It's March already! I can't believe it. And the tulips and daffodils are poking their little leaf tips up through the snow. I want to go out there and push them back down into the ground and tell them to hold on for just a few more weeks! Oh well, if they don't have the sense to stay down in the warm dirt till the snow melts than its their own fault if they freeze their little noses off. Can you tell I am SO ready for spring? Since I can't rush the season, I can rush the next Block of the Month -- Block 3 Ruby Rings! Its a beauty too. How I love these bright jewel tone colors. They are so cheerful. I know it is only Feb 25 but I just needed to do something fun. So, here, a few days early, is Block 3! 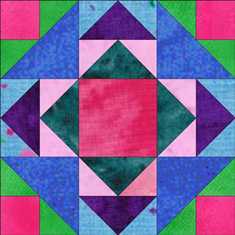 Trot on over to the Free BOM Page and download Block 3 and the optional foundation pattern. Remember, these blocks are only available for 2 months, and then they will be for sale on my website. 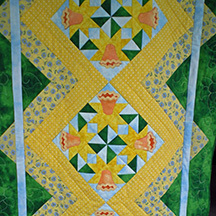 Why not go over and take a look at my Daffodil Table Runner. It would really brighten up your table and bring a little spring inside! This table runner is really big! And it is mostly pieced with only a few little bits of applique, and some fun ric-rac flowers! And to make it easier to get this bright spring time pattern I put it on sale for the month of March only!! Stay tuned, because I will post the winner of the February BOM prize pack on March 1. Hey, and look what I just discovered!!!!! 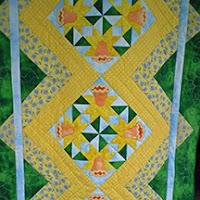 My spinning sunflower pattern is the #1 Download on E-Pattern Central. Take a LOOK. And its only $3.95 to download. What a bargain. Your not the only one who wants spring...I do miss the sun. I love the daffodils, its so full with colors and make my day springlike. Thank you so much for sharing it with us. The only problem, still have to practice applique. Love the colors on your BOM, I will go and take a look. I want to thank you for the blocks. The quilt is so gorgeous. Foundation patterns is going to make it so easy for me. So, thank you! Beautiful block again!! Thank you for sharing and the daffodils really do make me feel like Spring is coming.